Let's first look at present day six digit people. The six fingers and toes phenomenon with the Waorani is very interesting as it occasionally shows up with other people all over the globe. It is not just limited to that one tribe. Actually I stumbled on other "tribes", which have the six digit phenomenon running through their genetic lines. It is amazing, when you start researching that stuff, that what you thought is a singular case, turns out to be one of several. In April of 1673, James Needham, an Englishman and Gabriel Arthur, possibly an indentured servant came with approximately eight Indians, as explorers to the Tennessee Valley. There, Needham described finding "hairy people .... (who) have a bell which is six foot over which they ring morning and evening and at that time a great number of people "congregate together and talk" in a language not English nor any Indian dialect that the accompanying Indians knew. And yet these people seemingly looked European. Needham described them as "hairy, white people which have long beards and whiskers and wears clothing." These people claimed that they were descended from a group of Portuguese who had been shipwrecked or abandoned on the Atlantic coast. The term they used was `Portyghee.' In other documents, some of these peoples were also described as having red hair and others with VERY distinctive blue or blue/green eyes. 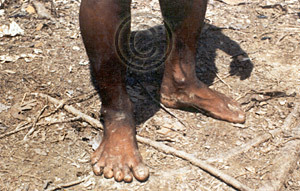 Interestingly, some descendants of the Melungeons, as they are called, have six fingers and toes! There is a region near Efes (Ephesus), Turkey, called "AltI Parmak" - many of the people there have historically had six fingers. If the characteristic of six digits shows up in people when the gene responsible for this becomes dominant, it means that this gene must come from somewhere in the past. The answer: it comes from the giants. The Bible mentions that: "There was war at Gath again, where there was a man of great stature who had six fingers on each hand and six toes on each foot, twenty-four in number; and he also had been born to the giant." 2Samual21:20. The remains of a giant was discovered during mining operations in County Antrim, Ireland, in 1895. The giant was 12ft, 2in tall and had six toes on the right foot. The gross weight was more than 2 tons, so it took half a dozen men and a powerful crane to place this article in position for a picture. The giant was brought to England and exhibited, but was later lost. 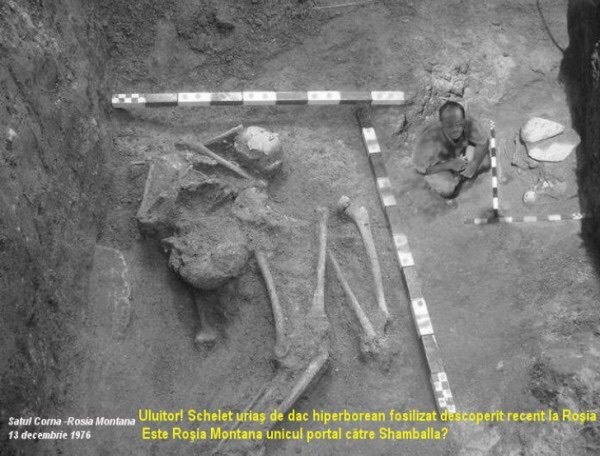 Massive Cover-Up Of Giants In Romania.. What Happened To These Giant Bones? 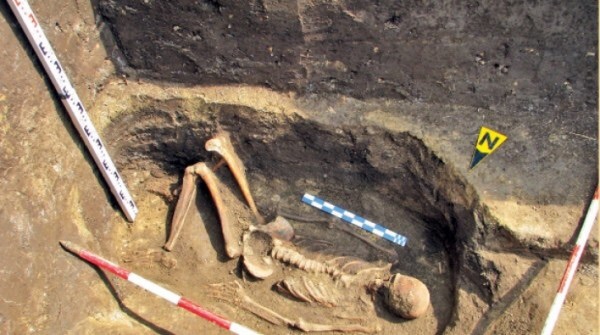 During excavations in a small village in Romania, peasants found dozens of giant skeletons and prehistoric solar calendars created by an unknown race. What happened to these giant bones? Giants were by no means only mythological beings. They were genetically engineered by a certain group of ancient astronauts and they played a very important role on our planet. 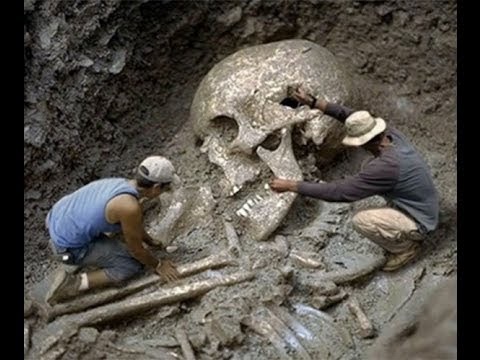 It is no secret that remains of giants have been discovered world-wide. It is also an unfortunate fact that there has been a massive cover-up to deny the world any knowledge of these immense skeletons. Ever since the first giant bones were unearthed, scientists, historians and archaeologists have all been involved in debunking the existence of this powerful ancient race that once almost ruled the world. Bones of giants have been deliberately destroyed, hidden in secret vaults, or simply labelled as remains of long extinct animals, like for example dinosaurs. Our search for traces of giants takes us this time to Romania in Eastern Europe. We learn from Romanian mythology that Earth was inhabited by different humanoid races in the past. At the beginning, the Oghars walked the Earth. However, they resembled deformed humans and they disappeared eventually. Were the Oghars perhaps an early, failed genetic experiment conducted by our ancient astronauts? Our extraterrestrial gods created a number of human races during different time epochs. Ancient Romanian stories tell that after the Oghars vanished, giants suddenly appeared. They rebelled against God and were sentenced to die during the Flood.In numerous sacred ancient texts, myths, and legends relate how the gods attempted on several occasions to create intelligent beings. After the giants, humans started ruling the planet. However, humans will eventually be replaced with blajinii, a race of small stature beings who have a good soul and are pleasing to the gods. Although many graves of giants have been discovered across the world, it is not often we encounter people who have participated in the excavations and can tell the public about what they saw with their own eyes. Ionita Florea, who is today an old man, has been involved in several archaeological excavations in Argedava, Giurgu county, Romania. Romania has a long tradition of giants. For some reason, no-one knows why, giants were nicknamed Jews. One possible explanation could be that people called them “Jews”, is because these beings came from Israel. Did the mysterious pre-Adamic Didanum race that originated from Israel visit Romania? The Didanum people were ancestors of the Nephilim and Rephaim who were giants. The country’s most famous giant was called Novac. He fought several battles against a dragon that tried to harm people. Novac finally defeated the dragon that fled and left a trail on Earth. Ionita Florea tells of an old place called Nucetul. It is a town in Bihor county, western Transylvania, Romania. Its name means “Walnut Trees”. In 1926, a Dacian fortress, that was very unusual in size and much larger than excepted was discovered in Argedava. Vasile Parvan, the archaeologist in charge of the excavation was convinced that he had found the first capital of Burebista. Excavations were carried out several times until 2000. Later, it turned out that the fortress was in fact the first citadel of Burebista, the king who united all the Dacian tribes and ruled half of Europe between 82 B.C. – 44 B.C. Between 1946 and 1956, archaeologists and peasants who helped with the dig, discovered 80 skeletons of giants. The remains were of humanoids who had had been between 4 to 7 feet tall. Ionita Florea who participated in the excavations for three years, tells his story of what really happened at Argedava. “I began to dig here in 1947 with a team of archaeologists. They employed about 30 people in the village. I was the youngest of all, being only 18 years. They paid us 400,000 lei, ($9-$12US) per day. I was poor at the time and I needed work. I could buy almost one kilogram of corn for the money. Once, after I dug to a depth of four feet, I unearthed a giant skull. It was two or three times the size of an ordinary human. I went and told Dinu V. Rosetti, one of the archaeologists about my discovery. As soon as I showed him the skull, all villagers were immediately sent home, and the archaeologists continued to dig on their own. 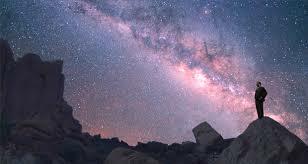 What Ionita Florea relates is just one many dreadful cover-ups undertaken by so-called men of science who are determined to deny generation after generation the right to learn the true history of our planet. Voltaire (1694-1778) was certainly correct when he declared that “History is the lie commonly agreed upon”. 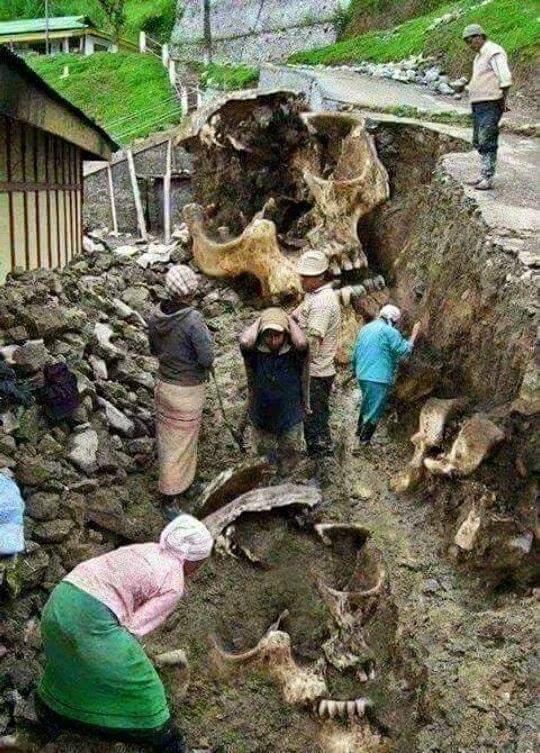 There is a gigantic human skeleton found in the Himalaya of Nepal near India. Because of the heavy earthquakes in Nepal there are many mysterious things found. These pictures are pretty shocking and unrealistic and we honestly don't know what to say about it. It's completely up to you to judge about these pictures. I think the Nepal pics are fakes, there was a photo site running a competition to photoshop digs & so forth with giants in them, & since then they have been popping up all over as "real". Giants are real, so all I can think is that someone came up with a great idea to flood the subject with dis-info, in this case in the form of fake pics. The most famous report - about giants and underground cities - appeared in the April 5, 1909 edition of The Arizona Gazette, entitled “Explorations in Grand Canyon.” Explorer G.E. Kinkaid discovered a huge underground “citadel” while rafting on the Colorado River. I think you would enjoy this ria .interesting stuff.